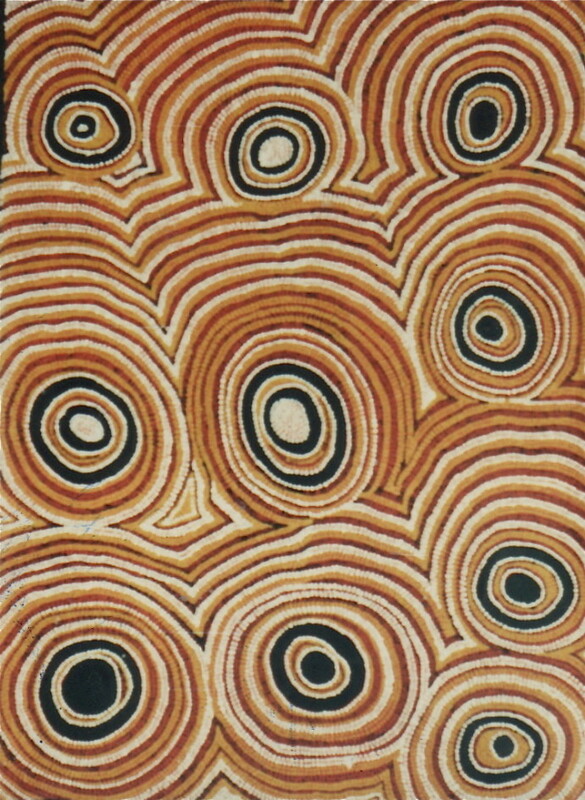 The Lajamanu Aboriginal Community is situated on the edge of the Tanami Desert, midway between Alice Springs and Darwin, in the traditional country of the Gurindji people. 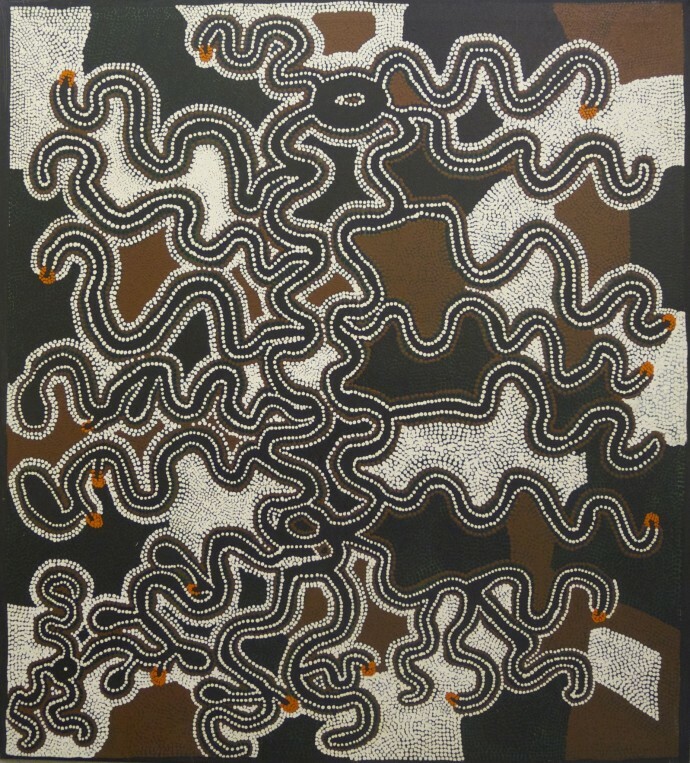 The paintings on show at the Rebecca Hossack Art Gallery from 6 - 31 August are unlike any other Aboriginal paintings ever created. They have an unselfconscious fluency of line and are essays in pure color. 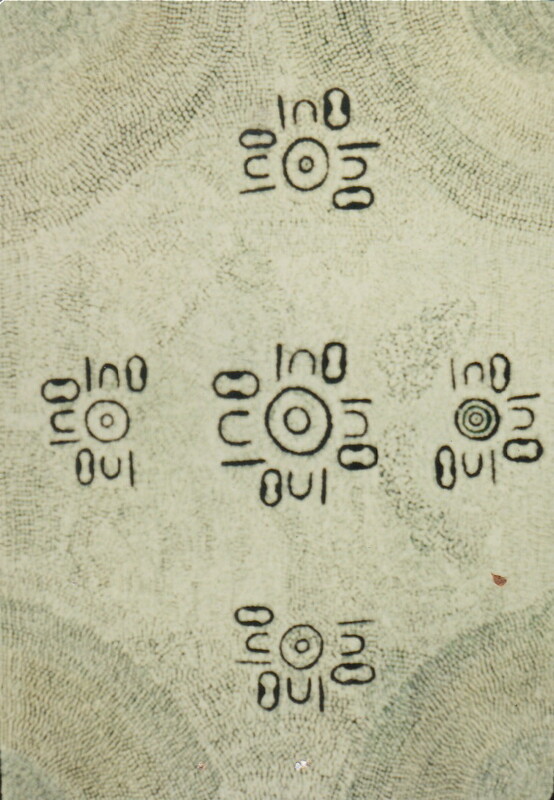 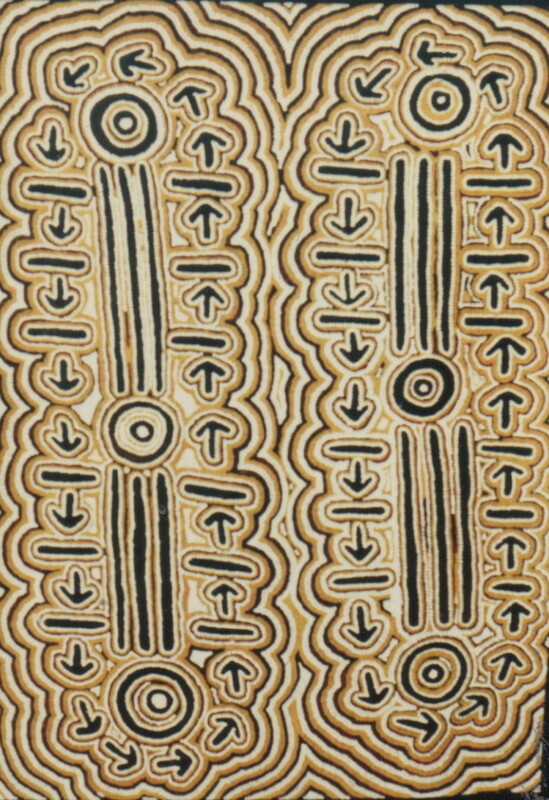 Pigment is applied loosely, tight symmetry is absent and space has a positive value. 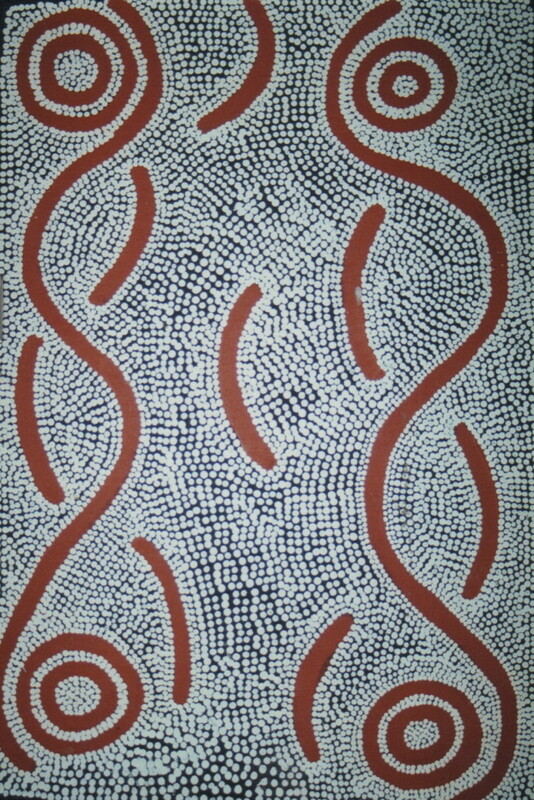 In ‘Ngalyipi’ by Ronnie Lawson Jakamarra, the myriad white dotting echoes the fluent rhythm of the rolling black lines or Jukupurra, (Dreaming tracks). 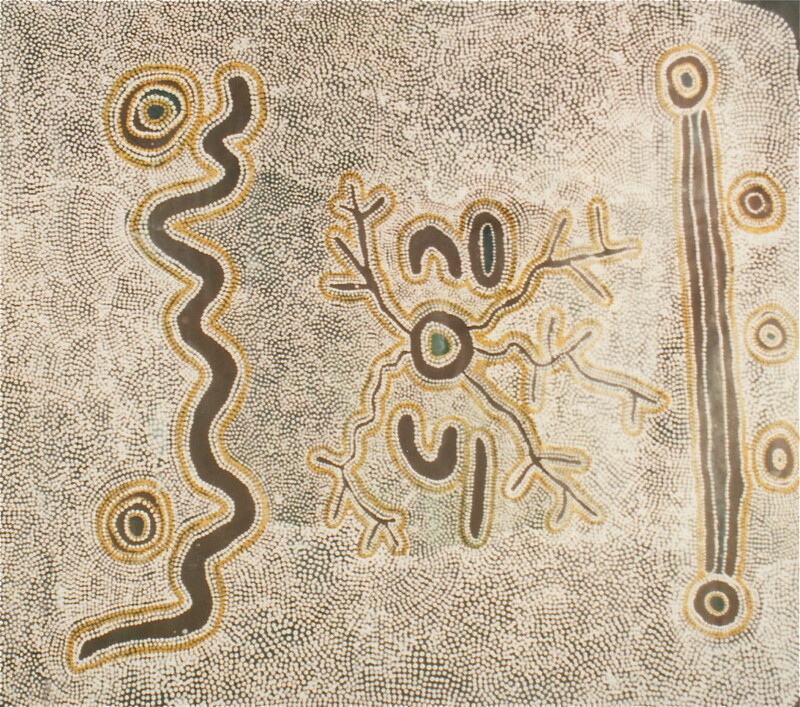 To an eye accustomed to the European Art of the 20th Century, these works bear a closer resemblance to Miro or Klee than to what is commonly thought of as ‘tribal art’. 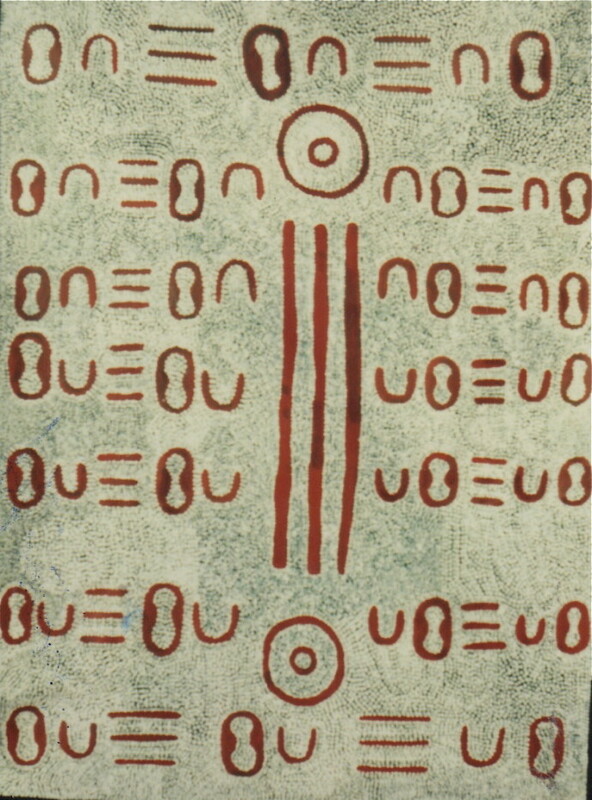 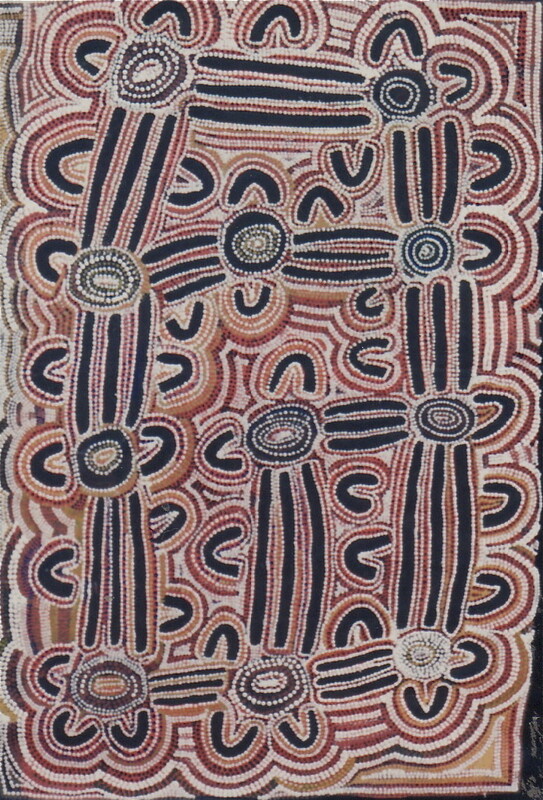 The twenty paintings in this exhibition are created by men and women from Lajamanu. 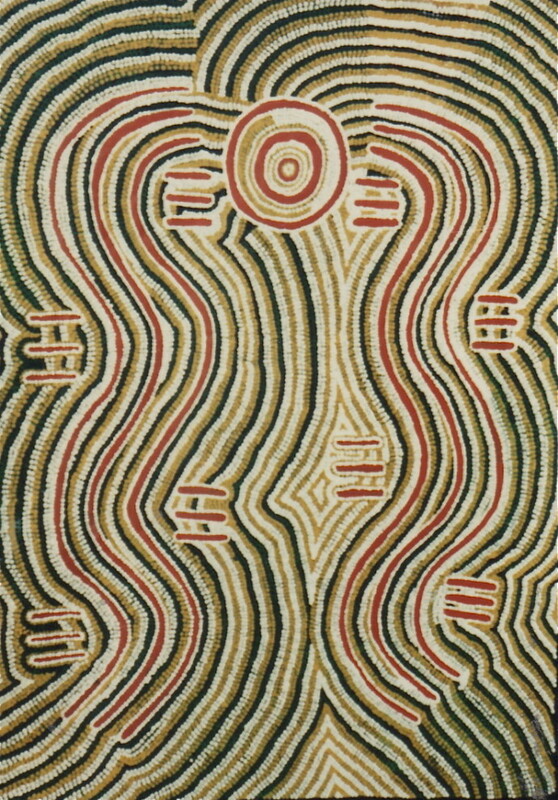 It is important to realize that Walpiri womens’ designs differ in mythological content and visual thrust from those of the men. 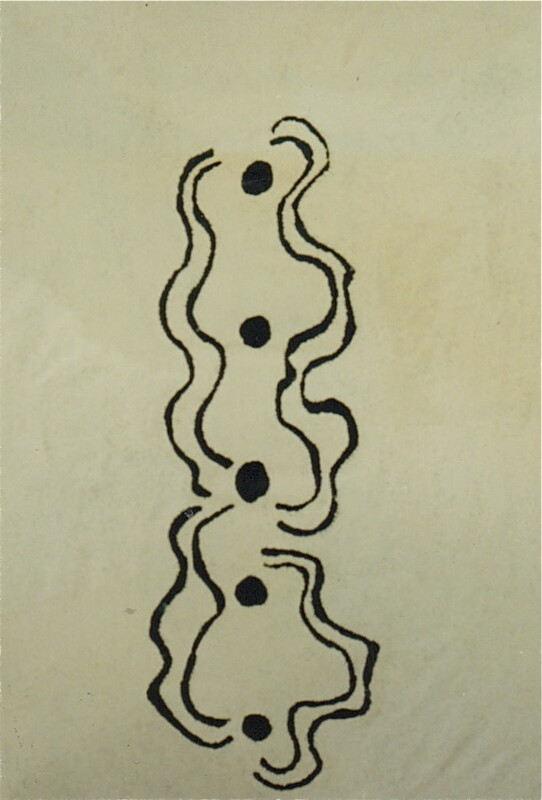 In ‘Yawalyu’ (women’s rituals), principles of fertility and growth, and activities at a specific locality are stressed, whereas in men’s ceremonies, the routes taken by ancestors linking significant places are of primary importance. 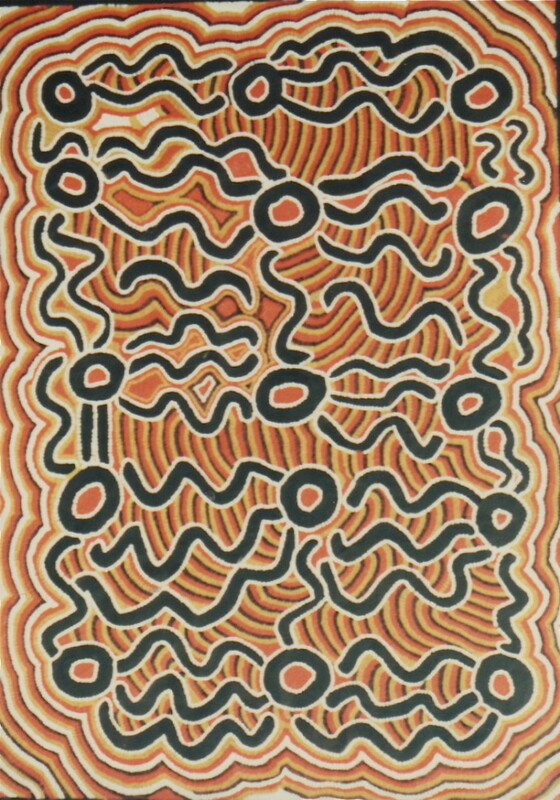 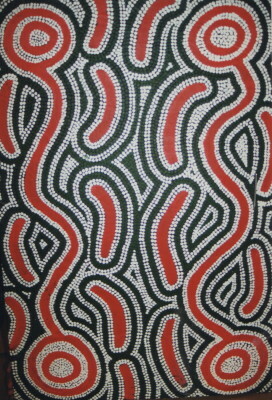 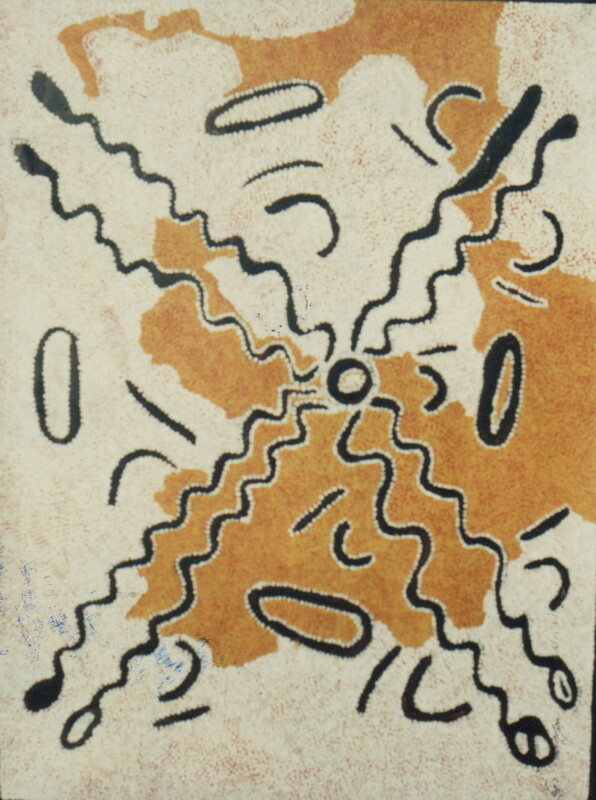 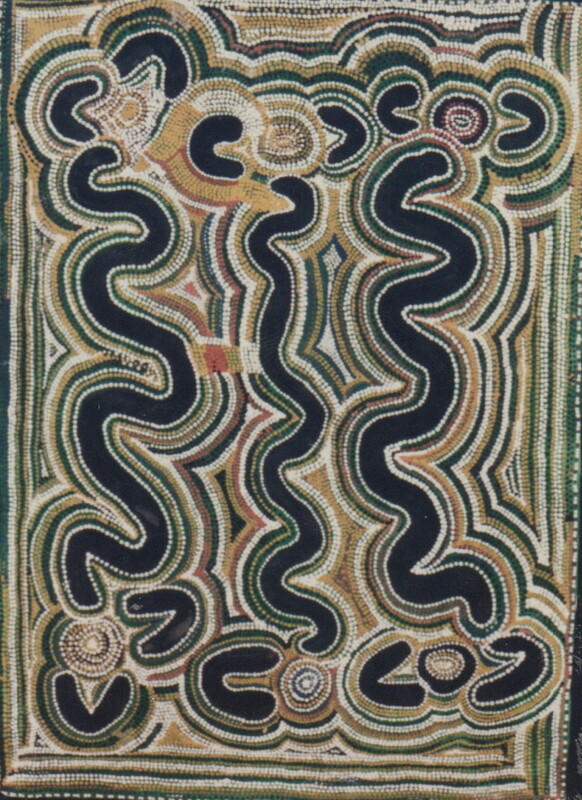 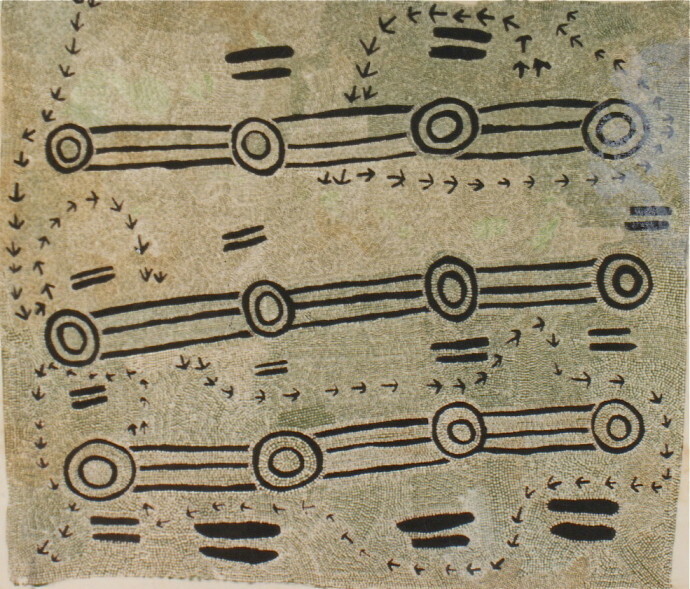 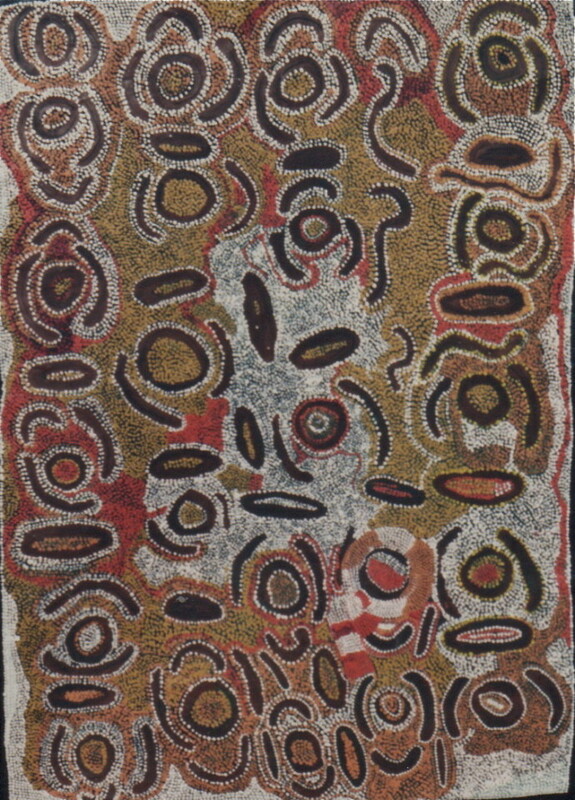 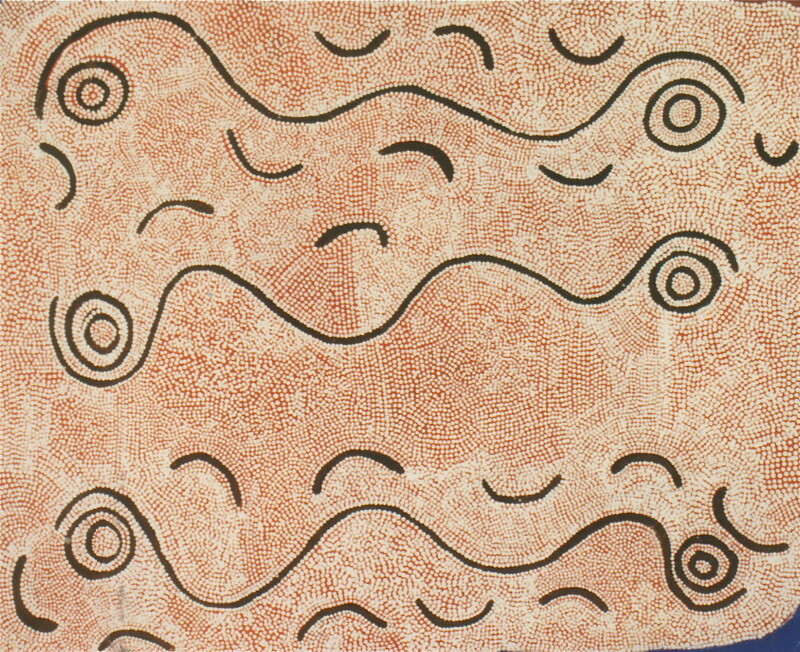 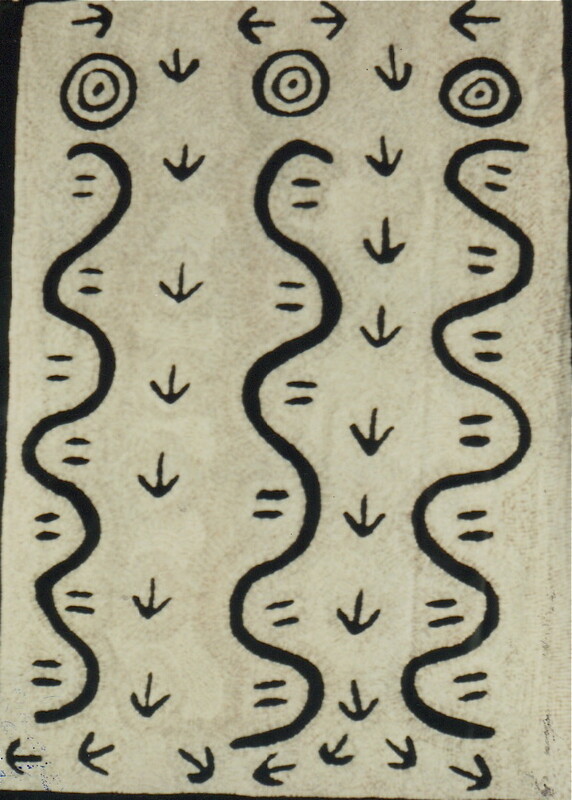 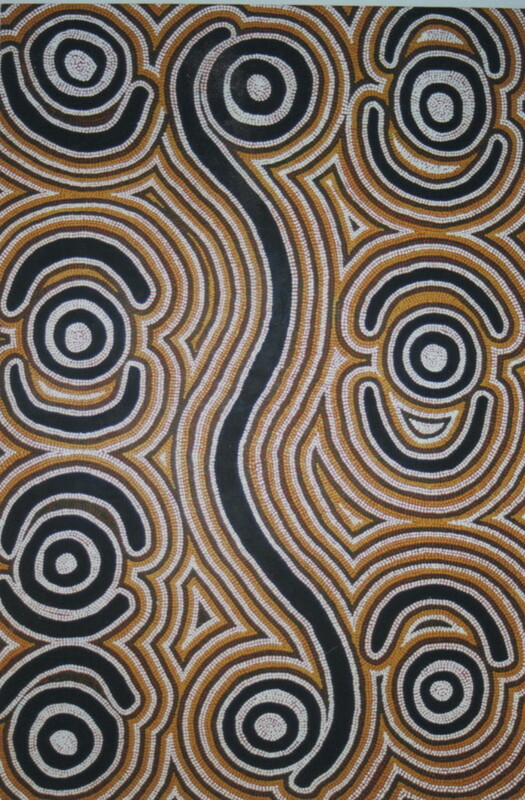 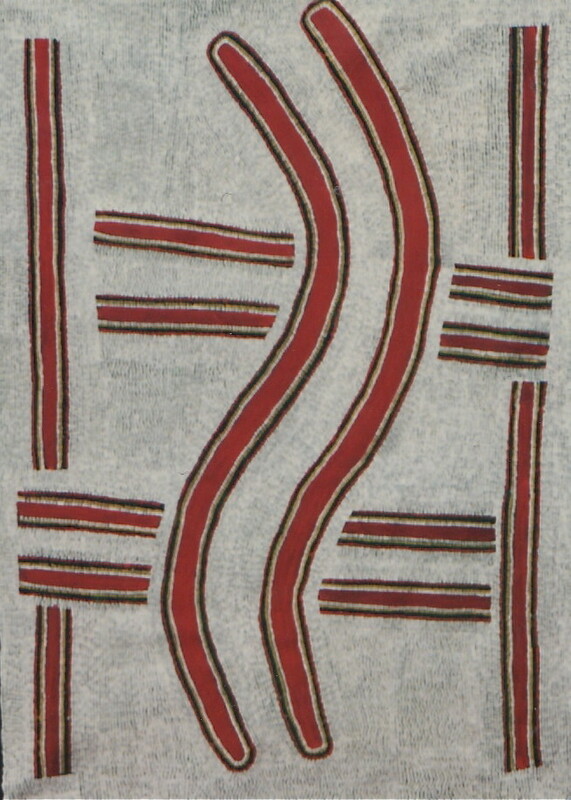 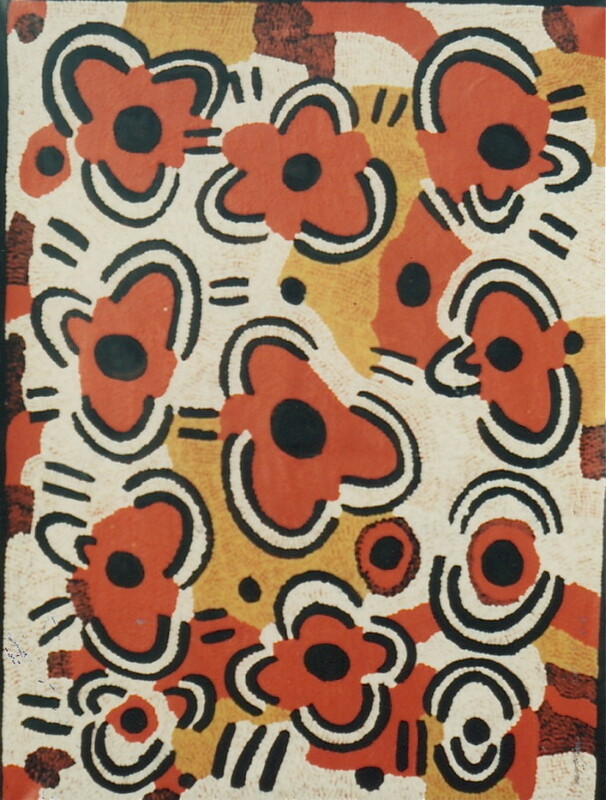 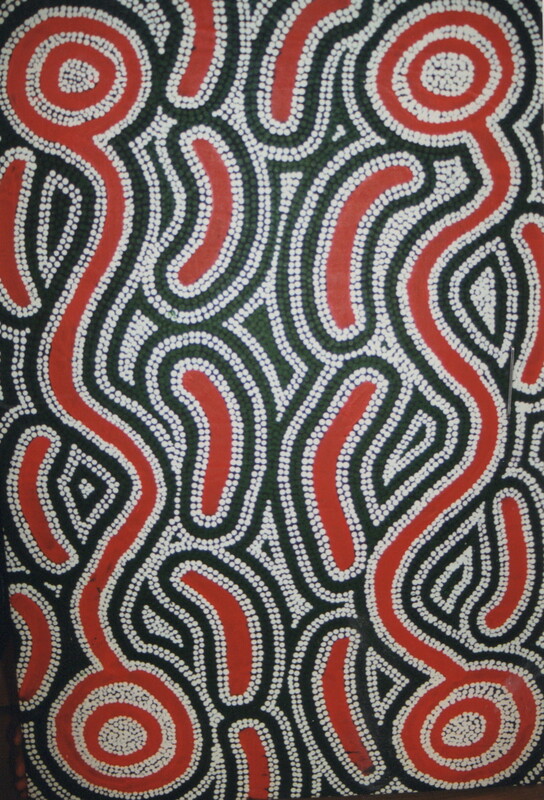 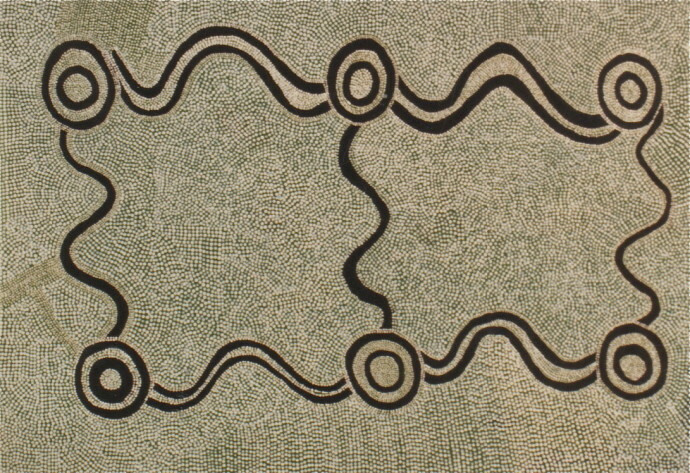 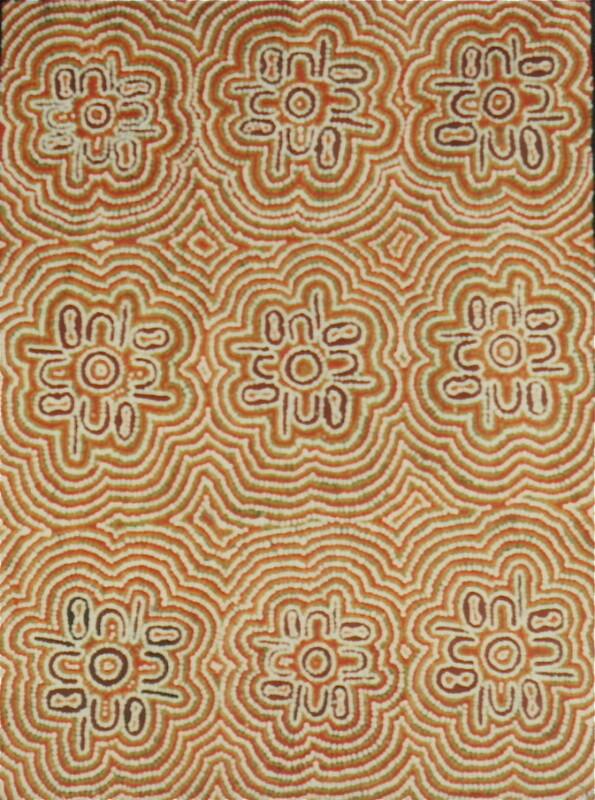 Women’s Kurawarri ancestral designs tend to be curvilinear, circular and formed of smaller, separate units in abundant clusters, whereas straight or meandering track lines dominate men’s designs, as in Jimmy Robertson’s ‘Ngapa Dreaming’. All paintings created at Lajamanu are organic in rhythm. 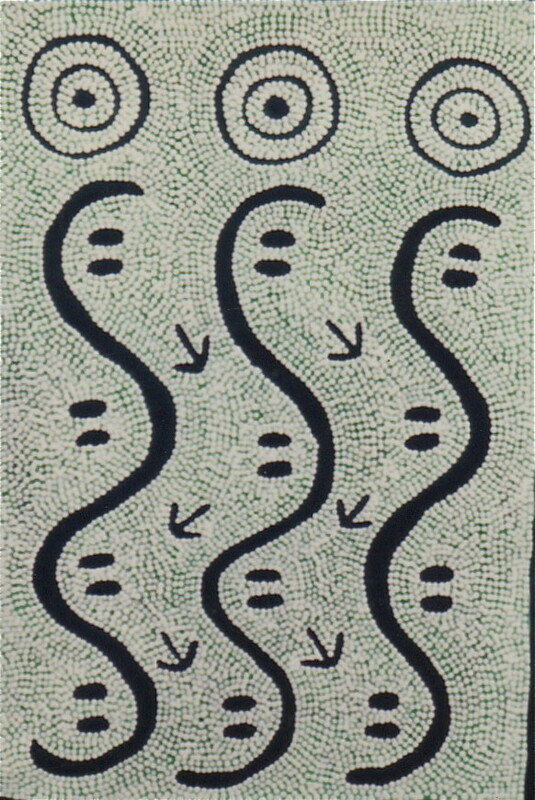 They have a striking beauty and formal intensity. 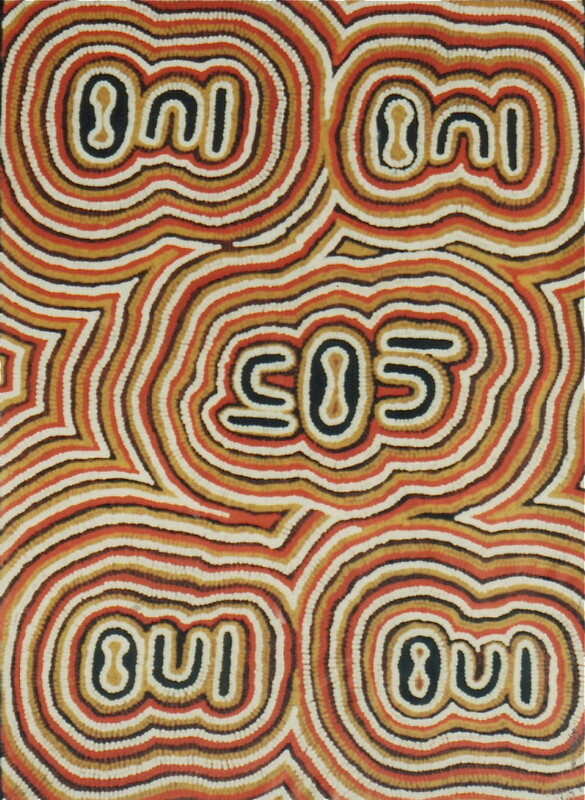 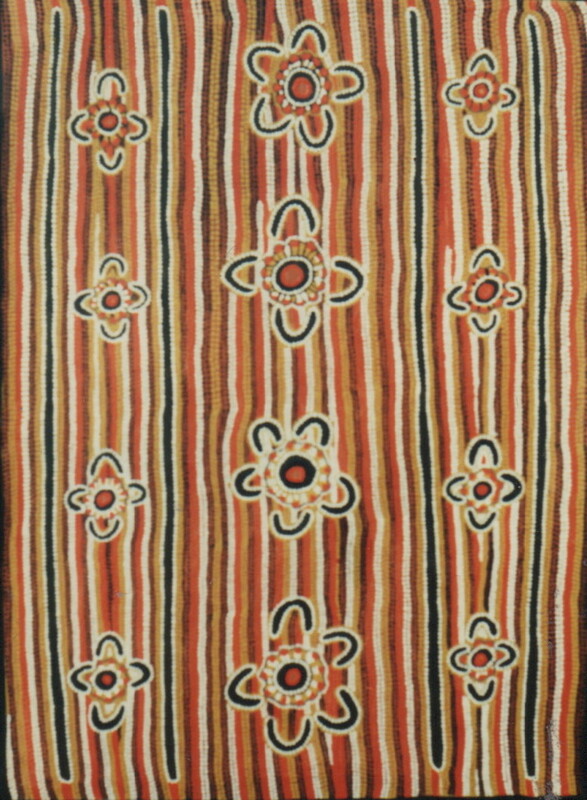 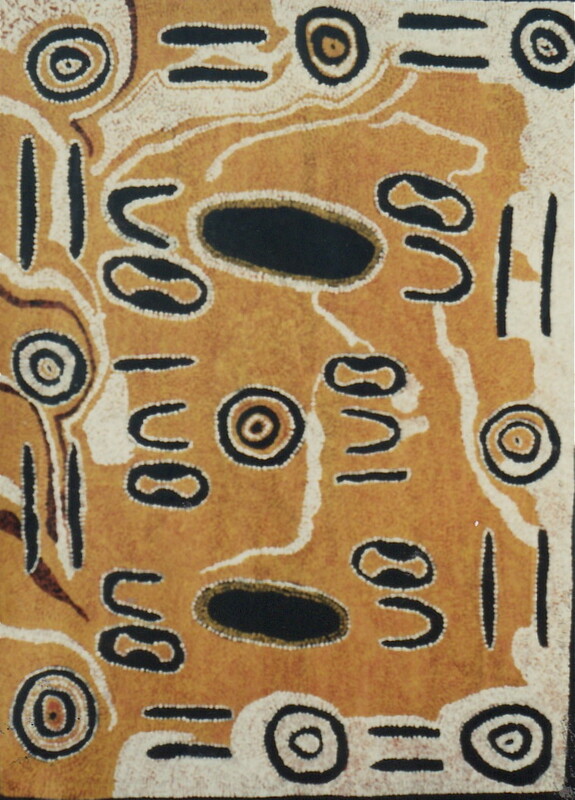 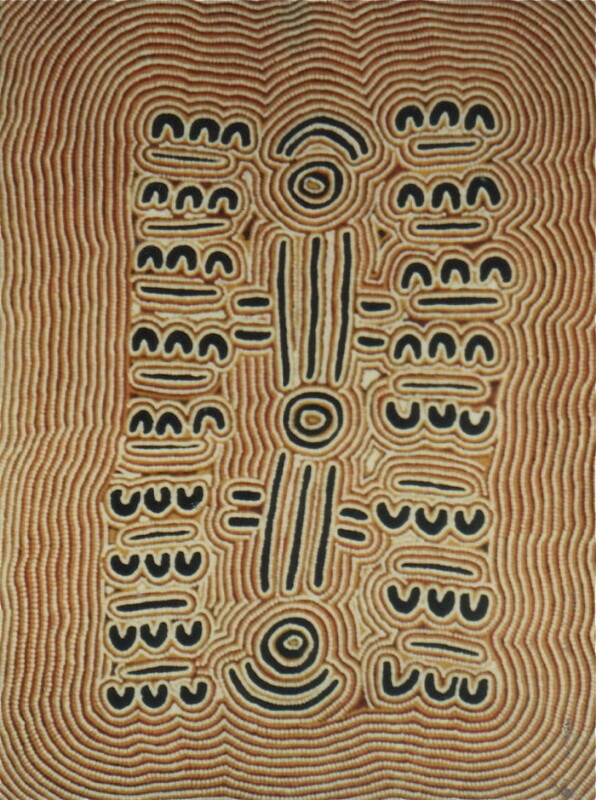 No other Aboriginal community produces work with such a powerful use of Kurawarri ancestral signs and magical use of color in unexpected combinations. 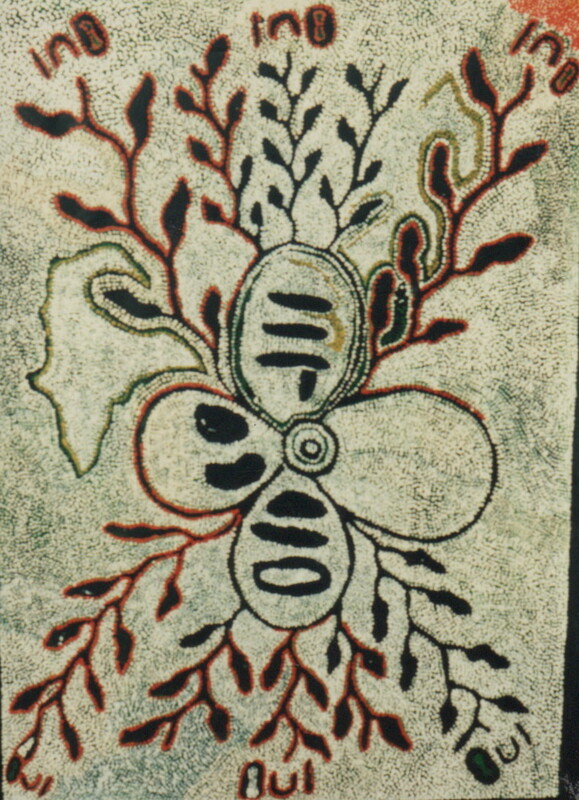 This is all the more extraordinary when one realizes that painting on canvas and board only began at Lajamanu five years ago in 1986. It began with a chaotic enthusiasm, as with bold vigor these artists confirmed their charters to particular tracts of land and re-enacted the paths that warna (snake), mala (wallaby), or Ngapa (water) ancestors followed through their country. 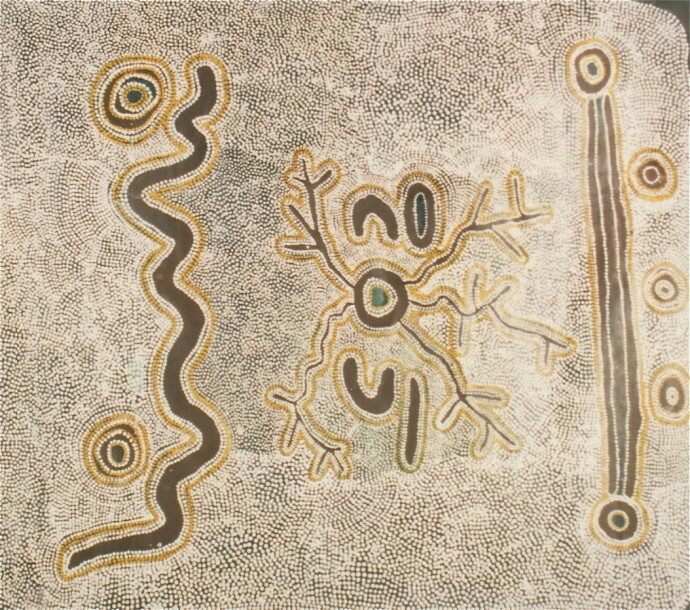 The painting preserves the knowledge of the Dreaming. 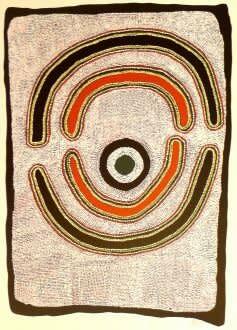 It is done by those who still have the ‘healing stones’ inside their bodies. 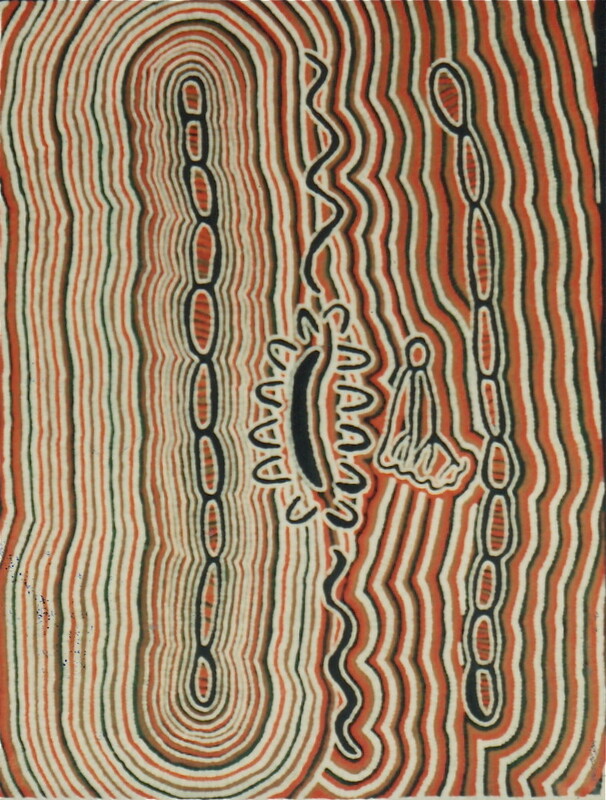 For many Aboriginals, white civilization has brought a sense of disempowerment and loss. 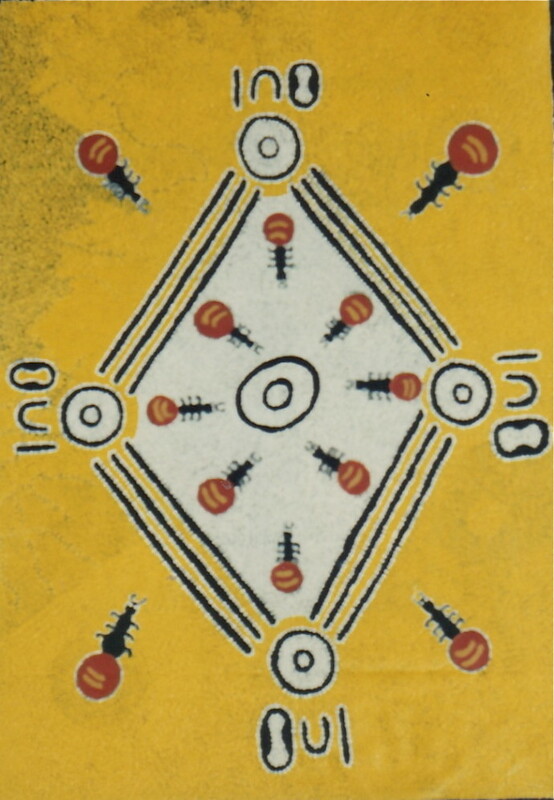 Ronnie Lawson Jakamarra says 'now you will not find many people with those strong ngangkaya (healing) stones inside their bodies anymore. 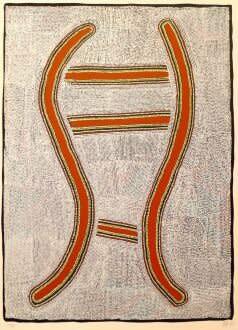 We have become weak from sweet food and drinking cordial'. 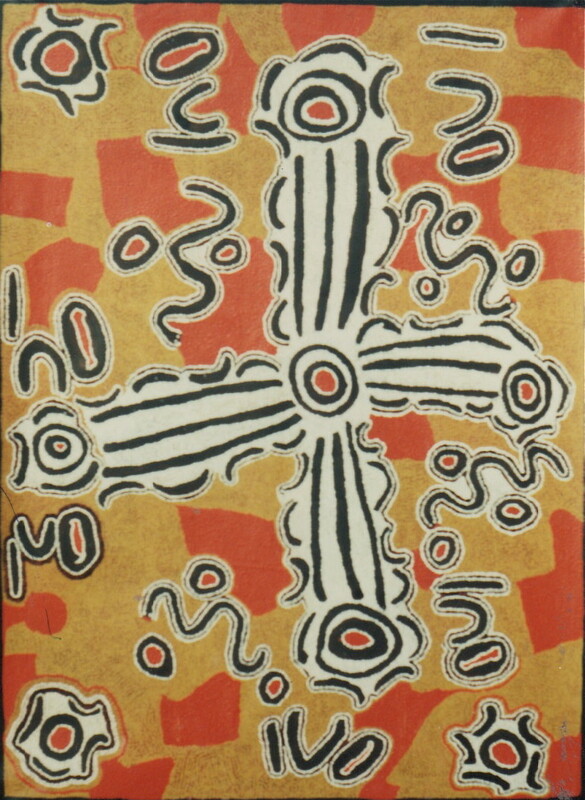 “I not only learned the white man’s ways, but I also learned my corroborees. 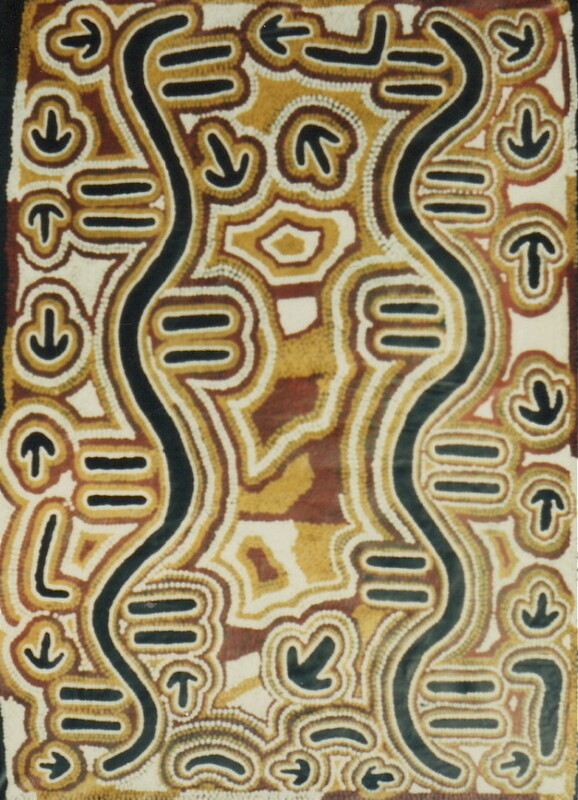 I got to know that part of my life, my religion, my dances and my songs…where my country was and where my Dreaming starts and ends”.